"We can sit outside in comfort as well as swim in lovely warm water." 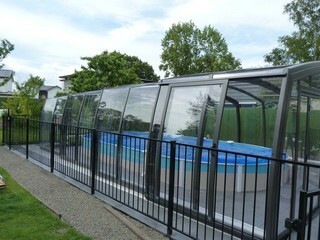 We have been delighted with our pool enclosure which is proving a huge benefit - goodbye easterly wind and goodbye heat pump. We can sit outside in comfort as well as swim in lovely warm water. We've had to open the enclosure to stop the pool becoming too bath like - after it got to 34 C! Post earthquake repairs the thought of dealing with more trade persons was not one we relished but Wendy and Roland are like a breath of fresh air. They guided us to a decision about which enclosure was right for us with no feeling of pressure. The whole process was explained clearly, installment started on time (in fact a few days early) and finished as scheduled , we were charged as per contract with no hidden surprises or unforeseen costs. Many thanks Wendy and Roland, great job, great product.